Jiang Peikun, a professor of Chinese literature at People's University, did not participate the movement himself. At the night of massacre, he and his wife Ding Zilin had been anxiously waiting for news of their 17-year-old son Jiang Jielian. They did not receive the dreadful words until noon of June 5th, that their son had been killed at Muxidi. 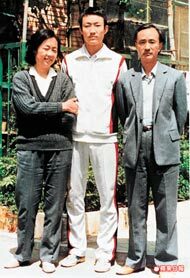 Ding Zilin, Jiang Jielian, and Jiang Peikun (from left to right) in May, 1989. In the early 1990s, Jiang Peikun helped Ding Zilin and a group of other parents of those who were killed to found the "Tiananmen Mothers" organization, dedicated to collect, edit, and publish records of victims. They also call on the government to reexamine the event. In 2008, Jiang Peikun suffered a stroke and was temporarily paralyzed. However, he persisted in completing the production of a documentary titled Road of Tiananmen Mothers. Jiang Peikun died of heart attack on September 27, 2015. He was 82.